Though it hurt Desperate Housewives, the season finale of Survivor wasn’t strong enough to reign as the night’s most-watched program as ABC took households and adults 18-49, while CBS stayed close and took viewers. 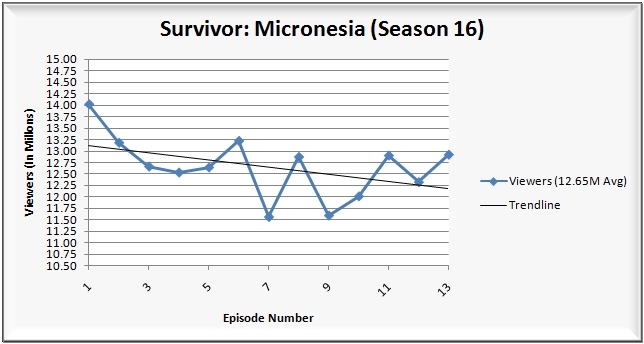 Continue reading for the night’s complete ratings, plus since two shows had their season finales last night (ABC’s Brothers & Sisters and CBS’s Survivor) I’ve added season ratings charts. Check it all out after the jump. ABC finished in first place for the evening with a 7.1/12 household rating/share, was second among viewers with 11.49 million and was first among adults 18-49 with a 4.0/11 with a rating/share among . 7:00 p.m.: America’s Funniest Home Videos (4.4/9 HH rating/share, 7.78M viewers, 2.4/8 A18-49 rating/share). 8:00 p.m.: Extreme Makeover: Home Edition (6.8/12 HH rating/share, 11.93M viewers, 4.0/11 A18-49 rating/share). 9:00 p.m.: Desperate Housewives (9.7/15 HH rating/share, 15.24M viewers, 5.5/15 A18-49 rating/share). 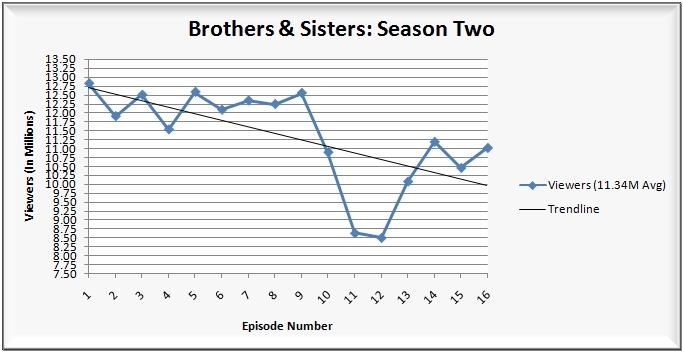 10:00 (10:02) p.m.: The second season finale of Brothers & Sisters (7.4/13 HH rating/share, 11.02M viewers, 4.0/10 A18-49 rating/share). CBS followed in second place for the evening with a 6.9/12 household rating/share, but managed a first place finish among viewers with 11.76 million and was back to second among adults 18-49 with a 3.6/10 rating/share. 7:00 p.m.: 60 Minutes (7.0/14 HH rating/share, 10.36M viewers, 1.9/6 A18-49 rating/share). 8:00 p.m.: The 16th season finale of Survivor (Micronesia) (7.2/12 HH rating/share, 12.92M viewers, 4.4/12 A18-49 rating/share). 10:00 p.m.: The Survivor Reunion Special (6.0/10 HH rating/share, 10.84M viewers, 3.9/10 A18-49 rating/share). FOX finished in third place for the evening with a 2.9/5 household rating/share, 4.76 million viewers and a 2.3/6 rating/share among adults 18-49. 7:00 p.m.: A repeat of King of the Hill (1.6/3 HH rating/share, 2.38M viewers, 1.1/4 A18-49 rating/share). 7:30 p.m.: A repeat of The Simpsons (2.3/4 HH rating/share, 3.71M viewers, 1.8/6 A18-49 rating/share). 8:00 p.m.: The Simpsons (3.8/6 HH rating/share, 6.02M viewers, 2.9/9 A18-49 rating/share). 8:30 p.m.: King of the Hill (3.1/5 HH rating/share, 4.99M viewers, 2.5/7 A18-49 rating/share). 9:00 p.m.: A repeat of Family Guy (3.6/6 HH rating/share, 5.81M viewers, 2.7/7 A18-49 rating/share). 9:30 p.m.: American Dad (3.3/5 HH rating/share, 5.64M viewers, 2.7/7 A18-49 rating/share). NBC followed in fourth place for the evening with a 2.7/5 household rating/share, 3.97 million viewers and a 1.1/3 rating/share among adults 18-49. 7:00 p.m: America’s Favorite Mom (3.3/6 HH rating/share, 5.13M viewers, 1.3/4 A18-49 rating/share). 8:00 p.m.: Four back-to-back repeats of The Office (1.8/3 HH rating/share, 2.59M viewers, 0.9/3 A18-49 rating/share). 10:00 p.m.: And that was followed by a repeat of Law & Order: Special Victims Unit (4.2/7 HH rating/share, 5.58M viewers, 1.6/4 A18-49 rating/share). The CW was left in fifth place with a 0.9/1 household rating/share, 1.19 million viewers and a 0.5/1 rating/share among adults 18-49. 7:00 p.m.: A repeat of America’s Next Top Model (0.8/2 HH rating/share, 985,000 viewers, 0.4/1 A18-49 rating/share). 8:00 p.m.: Everybody Hates Chris (0.9/2 HH rating/share, 1.24M viewers, 0.5/1 A18-49 rating/share). 8:30 p.m.: Aliens in America (0.7/1 HH rating/share, 1.12M viewers, 0.4/1 A18-49 rating/share). 9:00 p.m.: The Game (1.1/2 HH rating/share, 1.55M viewers, 0.7/2 A18-49 rating/share). 9:30 p.m.: A repeat of Girlfriends (0.9/1 HH rating/share, 1.25M viewers, 0.6/1 A18-49 rating/share). Note: Network average numbers from the week prior are based on fast national data. Comparison’s from the week prior (or episode-to-episode, etc.) 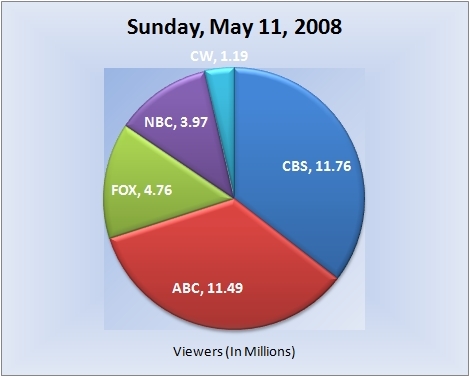 on specific shows are based on final national data. Ratings for the current day are based on fast nationals. (Expect all three scenarios to be the case at all times, unless otherwise noted). The final rating for first-run episodes that aired this evening will be reported the following week. So for example, the final rating for tonight’s episode of “Desperate Housewives” will be reported in next weeks report for Sunday, May 18, 2008. Source: Fast/Final National Ratings Data from Nielsen Media Research. Daily ratings figures can be found at PIFeedback and Zap2It.